Maintaining a work out routine while on vacation is not an easy task. However, completely abandoning exercise and a healthy diet isn’t necessary. If you opt for a beach vacation in the Mexico Caribbean, there are some general guidelines to follow that will allow you to stay fit and eat well. If you don’t eat junk food at home, don’t do it on vacation, a rule that is broken way too often. It’s been a full day of activities and the kids are cranky and tired so the quick fix is always pizza or fast food. Why not opt for something flavorful and local? On the white sand beaches of Cancun and the Riviera Maya, Ceviche is easy to come by. It is quick, healthy and very tasty. What is it? 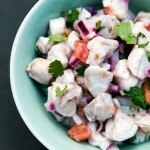 It is a fresh fish salad seasoned with lime, onions and cilantro. If you are not a fan of fish then chose from the wide arrange of fruits and veggies available that the Yucatan Peninsula has to offer. Have you ever heard of Chaya? Despite the fact that chaya in its natural from looks like nothing more than leaf of a tree, it the Yucatan’s equivalent to spinach and equally nutrient rich. Next time you are here ask for chaya water, a mix of chaya, pinapple and celery. Mmm yummy and refreshing. Adequate exercise doesn’t always imply heavy weights, treadmills or running a 5K. There are plenty of tours and activities in which you can indulge and it won’t even feel like you are breaking a sweat. Climb the stairs of the highest Mayan archeological site, Coba or explor the beautiful natural jungle that the area has to offer at Xplor Adventure Park. Xplor consists of zip lining, swimming and rafting. It is appropriate for all ages and comes highly recommended for families. Other activities include swimming with the Whale Sharks, snorkeling in a cenote or just a simple walk on the beach.